Russian pagan folk metal band Руян (Ruyan) from Naberezhnye Chelny is ready to release its second full-length album “Лебедь Белая“. The new album will be released by the Russian label SoundAge Productions, but the exact released date isn’t announced yet. Руян were formed in 2009, presenting a harmonious combination of metal and folk music: gloomy and folksy guitar riffs, clean and growling female vocals by Daria “Rodonitsa” and traditional instruments. The band released its debut full-length album “Наследие – Heritage” in 2010. 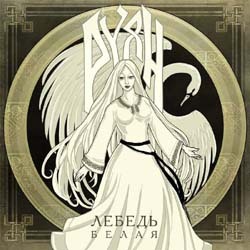 Their new album title “Лебедь Белая” translates to “White Swan” and the band has already unveiled its beautiful cover artwork and the tracklist.